Why Do Conservatives Deny Global Warming? Thread: Why Do Conservatives Deny Global Warming? Well, I can't pretend to know the answer to that question but after I "stumbled" across the following chart, I realized that conservatives may be deluding themselves with false data. Reproduced below, this chart suggests that there has not been an increase in global temperature changes over the last 4500 or so years. The moment I saw this graph, the hair began to rise on the back of my neck. First, anybody that shows a graph without indicating the units of the y-axis has something to hide. Second, to depict something as variable and complex a global temperature as such a smooth curve suggests dishonesty. Third, the labeling of the chart with the words "Nomanic Time" in bold is bizarre What is Nomanic? Fourth, why does this data go back only 4500 years? Most sources of climate data that goes back several thousand years also include data that go much further back. Fifth where did this data come from? It looks nothing like any climate data that I have seen. Finally, who on earth are Climatologist Cliff Harris & Metereologist Randy Mann? Well keep reading if you are at all interested. If you look very carefully at the graph, you will find that the baseline of the graph is 57˚F (label on the far right) and there was a point labeled 58˚F for now. They are reporting huge shifts of average global temperature which vary at most a couple tenths of degrees from year to year. The absence of normal variations that one sees in temperature charts indicates that the data must have been made up. Regarding "nomanic times", the Scythians are known as "nomanic invaders" but this is a esoteric word used mostly by historians referring to an obscure Iran-Afghan race. Perhaps it was a mispelling for "nomadic" and a period when the ancient Hebrews were nomadic. This also is consistent with a mostly biblical time line of the earth. The source of the data for the graph is unclear. Finally, if you look up Cliff Harris and Randy Mann, you will find that they are two guys who run a website http://www.longrangeweather.com/About-Us.htm and that neither are trained as a climatologist or a metereologist, unless one considered appearing on television to report weather or studying geology to be training for such a field. Harris apparently is a conservative Christian who believes in looking in the Bible for clues on what the weather will be (Source). Here are some real data from Nasa and other sources concerning the climate change. You can see that they are very different looking from the graph above. Last edited by Wise Young; 11-26-2007 at 10:10 AM. Fourth, why does this data just go back only 4500 years? LOL. There are a lot of folks who think the earth is only 6,000 years old. And, unfortunately, some of them are running for President. One of them might even be President. Would you please explain to me how scientists know what the temperature of the earth was 2,000 years ago? I can understand knowing there was an ice age, but how do we know temperature fluctuations throughout time? Translation: "As long as I breathe, I hope." The data come from multiple sources. 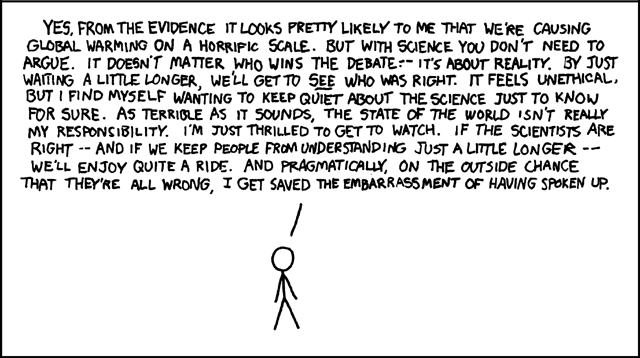 Probably the most compelling source of information come from ice cores. As you know, ice result from accumulation of snow and ice over many years, that recrystallize and have trapped air bubbles. A certain proportion of the water is heavy water (i.e. have deuterium or hydrogen that is heavier than regular hydrogen). Heavy water tend to condense faster than normal water molecules. Regular water molecules have lower vapor pressure and tend to evaporate more, particularly at higher temperatures. Therefore, the concentration of heavy water in the ice crystals give a reasonably accurate determination of the temperature. Note that the gas bubbles trapped in ice allow the measurement of carbon dioxide and other so-called global warming gases. That is how the chart showing temperature and gases over millenia. Available ice cores from the Antartica, Greenland, and high mountain glaciers provide temperature data back some 800,000 years. Of course ice cores from many places are collected and the data correspond to each other. It is this correspondence that gives the data such power and credibility. (Source). For the past 150 years, surface air and water temperatures have been measured with reasonable accuracy at stations around the world and written records are available. However, temperature recordings are unreliable before that period. Tree rings are another way of getting an estimate of temperature. Many trees have lived for hundreds of years. By comparing the rings across regions and time, it is possible to correlate tree growth rates with local temperature, precipitation, altitude, and age at times when data is available and go backward to when such measurements are not. Combined with the ice core data, tree ring data give a powerful confirmation of the temperature changes in the last 100 years compared with previous centuries (Source). â€¢ The Mt. Kilmanjaro glacier which has been around for 11,000 years may be gone by 2020 if the current rates of melting continues. â€¢ Siberian peatlands are beginning to thaw fro the first time in well over 10,000 years, releasing carbon dioxide and methane into the atmosphere. â€¢ The Larsen B shelf in the Antarctica has lost more volume than any time in recorded history. â€¢ The annual surface of Arctic ice has declined very significantly, again to levels that have never been observed in history. â€¢ Animals and insects are moving where they traditionally never go. For example, Moscow is becoming affected by mosquitos during the summers. It is curious how many of the predicted climactic changes of global warming have been arriving earlier than predicted. If you go back to 1990, for example, you will find that scientists were still talking about variabiity of temperature in different parts of the earth and how it will take a long time before global warming will affect the colder climes, such as winter in Sweden, as suggested by a tree ring study in Scandinavia (Source) but it seems that the summer temperatures have now reached those levels predicted to occur in 30-40 years but only in 15 years. I expect that you are seeing these changes in Norway. ...It is curious how many of the predicted climactic changes of global warming have been arriving earlier than predicted. If you go back to 1990, for example, you will find that scientists were still talking about variabiity of temperature in different parts of the earth and how it will take a long time before global warming will affect the colder climes, such as winter in Sweden, as suggested by a tree ring study in Scandinavia (Source) but it seems that the summer temperatures have now reached those levels predicted to occur in 30-40 years but only in 15 years. I expect that you are seeing these changes in Norway. It's official: Oslo residents just experienced their warmest September in recorded history. Meteorologists confirmed over the weekend that average temperatures last month were fully 4.2 degrees centigrade higher than normal. Locals are calling it the "endless summer." Not only did areas all over southern Norway have a long and unusually warm summer, now it seems like autumn has been postponed indefinitely. Flowers are still blooming around the capital, outdoor cafÃ©s are still doing brisk business, and the reemergence of sunshine on Sunday lured thousands out to city parks, the waterfront and the hills around Oslo. Sailboats drifted along on the fjord, and it was the first of October. "This is extreme," Niklas Sondell of the state Meteoroligical Institute told newspaper Aftenposten, noting that September's average daily temperature of 15C (59F) is "sky-high over the normal" of 10.8C (about 51F). There also was much less rain than normal. Sondell said that he compared Oslo's weather in September to that in Paris, "just for fun," and discovered that Oslo could boast Parisian-like conditions. The average temperature at Beauvais airport north of Paris was 14.9C last month. The previous record high average for Oslo was set in 1999, with 14.2C. Institute records go back to 1937. Source. The bottom portion of Norway's Storbreen (Big Glacier) in Jotunheimen has split in two and is steadily melting. Several years of warm summers and poor snowfall have left Bretunga, the lower part of the glacier, in poor shape. "The glacier is now clearly divided in two. Less than ten years ago it was completely joined there at the bottom," Liss Marie Andreassen, glaciologist at the Norwegian Water Resources and Energy Directorate (NVE), told Aftenposten.no. Andreassen's doctorate focused on Storbreen. She says that the glacier has retreated around 60 meters due to melting since 1997, and since measurements began in 1949, the ice has melted about 500 meters back from its previous edge. More or less all of Norway's glaciers are now on the retreat according to the NVE. They are shrinking in both length and volume, and the trend has been clear since the beginning of the 20th century. Source. A 3D model image that shows the glacier's range over time, with the lowest mark coming from around 1750, a period known as Norway's 'little ice age'. At one ski resort located partly on a glazier, they now also have to start to produce artificial snow to be able to open the ski resort this season. It is one of the problems with the young earth theory. By dismissing all this data that occurred before 6000, a majority of people who believe in the young earth theory have no basis for interpreting data indicating that global warming is taking place. So, they deny it. Worse, they refuse to do anything about it and aggravate it further. And, there are those who believe the data but don't think that anything should be done about it. It is sort of like the farmers in the Southwest and Midwest who have been sucking out billions of gallons of groundwater to water their crops. It is clear now that if they continue to use water at that rate, they will completely use up all the groundwater. Their response? I heard one farmer say on NPR, "Why not? I own the land. If I don't take it, somebody else will." It is sad and frightening. Let me expand the discussion to another subject... fishing. I was having dinner with a leading marine biologist who has spent his life counting marine fish and other organisms. I asked him if it is true that we will have no more wild fish in the ocean within two decades. He more or less confirmed it. Biologically, the populations have gone below biological sustainability. He told two stories that were particularly alarming. • The oysters of Chesapeake Bay. This was once the worlds most abundant source of oysters. They were harvested by this ships dredging the oyster bars. The problem is that those dredges destroy the bars and oysters can no longer breed. In less than a century of oyster harvesting, they have now killed them all off. It turned out that there were so many oysters in the bay that they filtered the entire volume of the Chesapeake Bay every 48 hours. Now, of course, they are no longer filtering the water and the environmental consequences are huge. • The fish off the coast of Florida. My friend pointed out that it is not just commercial fishing that is depleting the water. In Florida, there are over 2 million registered boats and an average of 7 million trip-persons per year for fishing. They are just fishing all the fish out of the ocean and everybody seems to think that it is their god-given right to decimate the wildlife and kill off what has taken thousands of years to grow and develop. Politicians are unwilling to do anything to stop this. By the way, this is not only true of Florida but off the coast of California and Washington states. Cape Cod (named after the famous cod fish that use to be the main source of livelihood for the people who lived there) barely has any code left (Source). I mentioned how much Chinese love fish. In every Chinese restaurant in China, one sees aquaria filled with fish. They eat only live swimming fish. Probaby less than 10% of fish actually gets through to the restaurant still swimming. Much of the rest are thrown away or used for animal feed. A population of 1.3 billion people eating fish. It won't be long before all the fish in the Pacific are gone. China is the world's largest producer of fish, second only to Peru which is the second largest. China not only is the largest consumer but exports $3 billion of fish every year. The government of China strongly enforces treaty agreements, domestic fishing laws, and catch limits. They have forced the industry to reduce the number of fishing boats and fisherman, and have strongly promoted aquaculture. Despite these draconian policies enacted by the Chinese government to have a "zero growth" policy for wild fish catching, the pressure to get fish is decimating fish populations in the seas around China (Source). Actually, my friend said that the Chinese have been trying really hard. By comparison, the United States is not even trying. Politicians are unwilling to slow or limit recreational fishing. Despite years of dire warnings by scientists of ecological extinctions cause by overfishing and the serious consequences of such extinctions, the public continues to fish and then pretend to be surprised when there are no more fish left and the shores around the United States are showing the effects of the overfishing (Source). It is clear that the Magnuson-Stevens At, which required reporting of and limiting overfishing, is simply ineffective (Source) when it comes to recreational fishing. Yet, nothing is being done about the problem. Where is that much vaunted care and love of nature, the environment, and leaving earth a better place than when we came to it? It seems to have escaped the current generation of conservative Americans, or at least most of them. It is so sad that they are denigrating "liberals" are "tree-huggers". As a result, nothing is done until it is too late and the environment is gone. Memory is short. And you always have naysayers who won't believe the data. It is sad. There use to be a time when conservatives were in favor of preserving the environment. Now, it seems that most of conservatives are in favor of preserving the profits of the industries rather than preserving the environment. Since when was being an environmentalist relegated to the bailiwick of liberals? Last edited by Wise Young; 11-26-2007 at 11:39 AM. That... is scary. Dr. Young, just what do you think the environmental state of the world will be in - say - fifty years, besides the fish being gone? alot of places have quota's on catching stuff from the sea. Alaska being probally #1. crabs , cod, salmon and others. alot of fish , now come from fish farms. catfish , salmon and tilipia. lake Erie was basicly out of jumbo yellow perch for years. feds from USA and Canada bought out the commercial fishermen. 10 years later the perch fishing is fantastic. lots of perch and nice jumbo's. so things can be turned around if they take measure's and inforce them. you have to have a time limit on the season.